Barcelona (Mobile World Congress) – February 26, 2018 – Dynamics, Inc., today unveiled enhanced functionality for its award-winning, connected Wallet Card™ that allows two-way communications between banks and consumers using the card’s telecommunications connection. Previously, a Wallet Card consumer could only receive information from a bank. Today, Wallet Cards can be enabled to also receive information from a consumer. The ability for consumers to send information to their bank at the push of a button is revolutionary for a payment card and provides exceptional consumer functionality and value. For the first time, an issuing bank can engage in immediate two-way communications with a consumer via their debit or credit card and receive an immediate response. Additionally, a consumer no longer has to call a call center or go to a website to respond to account servicing questions. Purchase verification – If a financial institution suspects a fraudulent purchase using an existing card, the bank can ask a consumer to verify on their card that they made a particular purchase and the consumer can quickly respond. Immediate credit limit increase – Rather than potentially declining a transaction, the bank can ask a consumer if they would like to increase the credit limit on their card if their credit limit is approached. Add cards – If the bank believes a consumer may benefit from a new card offering, the bank can ask if they would like to download the new card immediately. Instant purchase feedback – The bank can ask the cardholder if they liked their purchase at the store/restaurant where the purchase was made and provide this as value-added information to the retailers. On demand coupons – If a consumer opts in, the bank can ask a consumer if they would like to download a coupon. This will drive consumer rewards and loyalty. Card upgrades – The bank can ask a consumer if they would like to upgrade their card to one that has additional features or value. The Wallet Card Consortium, which are the members of the industry that have announced public support for the product, are helping to make the card a reality. Currently, the Wallet Card Consortium includes Dynamics Inc., Mastercard, JCB, Sprint (a subsidiary of SoftBank), Emirates NBD (UAE), CIBC, IndusInd Bank, Sumitomo Mitsui, and other global payments networks. The Wallet Card Consortium will showcase the connected Wallet Card at Booth 8.0E13 at Mobile World Congress. Watch the technology in action at www.dynamicsinc.com. The Dynamics Wallet Card was named to the 2018 Global Mobile Awards (GLOMO) shortlist in three categories – more nominations than any other product – “Best Mobile Service for the Connected Life,” “Best Mobile Innovation for Commerce,” and “Best Mobile Innovation for Enterprise.” The GSMA’s Global Mobile Award nominations honor the latest and best mobile products, apps, devices, services, and initiatives to the industry and the world. The Awards are judged by a panel of 250 independent judges from across the world including leading industry and subject matter experts, analysts, journalists and academics and in some cases mobile operator representatives. Winners will be announced at the conference. Earlier this year, the Consumer Technology Association (CTA) recognized the Wallet Card and the Wallet Card Consortium members with four 2018 CES Innovation awards including the Best of Innovation Award for Security Technologies. It was an Innovation Award Honoree for Computers, Embedded Technologies, and Technologies for a Better World. This marked the first time in history a payments consortium, payments network, or bank was awarded the consumer electronics industry’s most prestigious award. 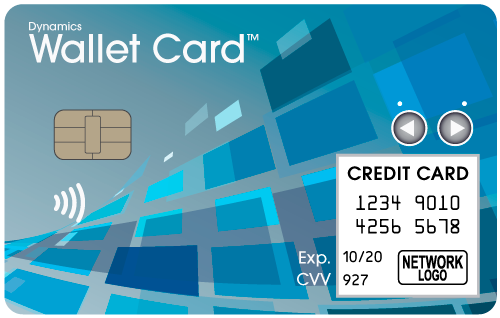 To be notified when a particular card will be made available to the public, consumers can register today for a Wallet Card™ at www.getwalletcard.com.